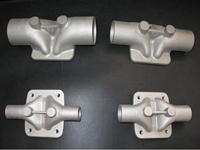 Stainless steel investment casting'>investment casting is one of our popular products. As a leading China investment casting manufacturer, ANYE mainly uses silica sol lost wax casting process to produce them weighting from 0.01kg to 30kg. Comparing with those investment cast made by sodium silicate process, silica sol investment castings have better dimensional precision and surface finishing quality. Because of the materials unique physical properties, steel investment casting'>stainless steel investment casting is widely used in various types of applications, especially corrosion resistance. Common markets for this kind of investment castings include automobile, aerospace, marine, automotive, hardware, oil and gas transportation, agriculture, construction and many more. The noticeable feature that characterizes stainless steel is minimum 10.5% of chromium content as the principal alloying element. Four major categories of wrought stainless steel, based on metallurgical structure are austenitic, ferritic, martensitic and precipitation hardening. Cast stainless-steel grades are generally designated as either heat resistant or corrosion resistant.